SALE PRICE $48.99 Per Straight Section. Buy Yours Today! Click here to request an estimate. NOTE: Minimum order quantity for the Stone-Themed Borders is 20 units. Our stone-themed border sections overlap at each end. You secure them with a 30″ spike (included in price). 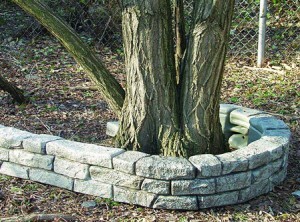 Plastic borders in a stone design add stone-age fun to your play area and a touch of class to your home garden. They can be installed or moved easily from place to place. Two types of section are available: straight sections and curved sections. These borders are made from roto-molded plastic, so they’re very strong (not as strong as stone, but definitely much sturdier than you would think). Each border has ribbing inside it, for strength. Our company doesn’t just sell these borders out of a catalog — we have installed them in gardens and playgrounds. And it’s no exaggeration to say that they’re much more authentic looking than you would expect. For more information, phone us toll free today! Our stone-themed plastic borders look incredibly realistic and make great landscaping borders for homes and commercial gardening projects. 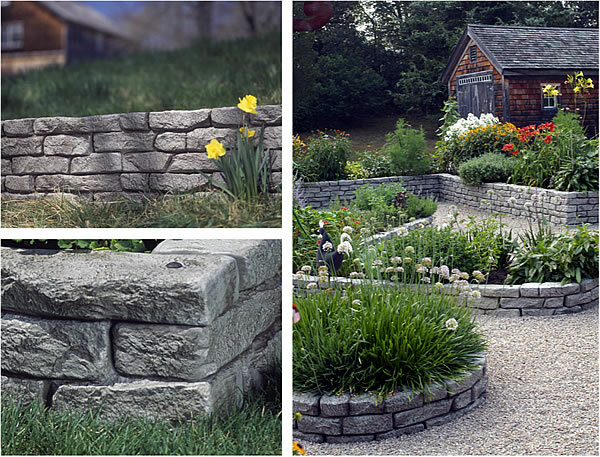 Get the appearance of stone without the cost and effort of building a real stone wall. These plastic borders require no expertise or special tools to install. They’re virtually maintenance-free, as well. They’re supplied by Maryland Materials, a leading national playground equipment and services company. These timbers can be stacked 2 levels high, creating a wall that measures 20″ tall. The ends overlap, and the borders are fastened with 30-inch galvanized spikes that drive into the ground. Just line them up, slide in the spike, and drive it home with a hammer or mallet! If you want to stack the timbers 2 levels high, just place them on top of each other and secure them in place using a longer 40″ spike (additional cost). Each plastic border measures approximately 48″ long x 10″ tall by 6″ wide. These faux stone borders are available in grey stone color only. Our faux stone borders are made from hollow polyethylene. Each border has molded-in ribs, giving them added strength. NOTE: Minimum order quantity for these borders is 20 units.